It’s coming up on the 44th anniversary of the most violent day in the history of Ocean Beach – the March 28, 1971 Collier Park Riot. After San Diego police charged a peaceful gathering of hundreds of OBceans, young people and students, street fighting between cops and civilians broke out – and for hours a riot raged in north OB, from what today is Collier Park, all the way to the beach, about a mile. It was the day that Ocean Beach was – in a very real sense – like Ferguson, Missouri. Fifty people were arrested, many at the protest were injured, one man was knocked unconscious, a patrol car was set ablaze, and a police officer lost an eye. It had been a protest against the Vietnam war and against the potential sale of land that Ocean Beach wanted as a park. 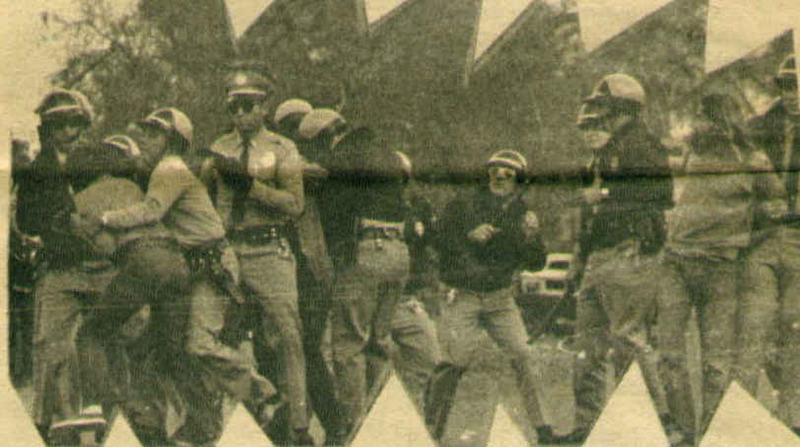 Now – 44 years later, the OB Rag is searching for eye-witnesses and any photos taken of the event. We plan on writing about the day, and have begun interviewing witnesses and collecting photos. So, if you were a witness – either as a participant or as an observer – please contact us. If you have any photos or any kind of footage of the event – please let us know. Contact us via email: obragblog@gmail.com or leave a comment to this post. And please give us contact info. If you from out of town, we have telephones and would like to interview you. It was a riot – OBceans fought back after being unjustly attacked. And we/they didn’t go peacefully. Many rocks were thrown that day and many residents and students were injured by police. The loss of the eye was brought up in every trial of those who contested their charges. In at least one instance, officers walked up to the porch of a nearby residence and simply arrested a guy and dragged him away. Like I said, it twas OB’s most violent day. Have you contacted Steve Rowell? He took a lot of the pics of OB back in the day and presently.